Read More Weds 24th & Thurs 25th April 2019 sees Magical Dance Parties 'Under The Sea' come to Mumbles Pier. Read More Did you know that Mumbles Pier Beach Hut Cafe is Dog-Friendly? In fact YOUR furry friend could even be our Dog of The Week! Read More Ideal for breakfast, lunch or dinner the Pier has an array of delicious dishes served all day in our Beach Hut Café. Read More Fill your little pirates tummies for less this half term. For every adult breakfast purchased in our Beach Hut Café at Mumbles Pier 9am-10am a kids breakfast is free. T&C’s apply. Read More Mumbles Pier are proud to announce our Charity of The Year for 2019. We are supporting the South Wales branch of Care After Combat. Read More Saturday 30th March 2019 sees our next Awesome Hour take place. At our Awesome Hours we open up our arcade an hour earlier on selected Saturdays, for additional needs sessions. Read More With over 100 machines and sheltered from the rain The Amusements at the Pier is perfect for a winter family day out. Read More Now open Copperfish Bar, Restaurant and Takeaway. Serving Welsh Ales and Ciders as well as traditional style Fish and Chips in this exquisite location. 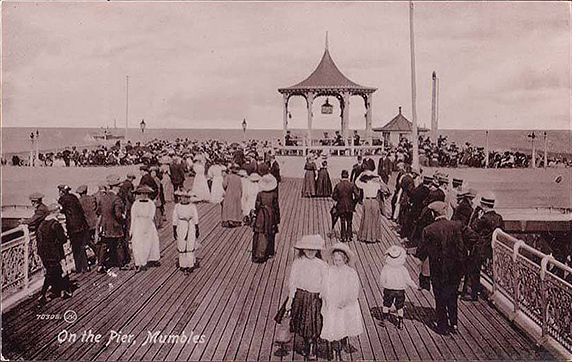 Read More Opened in 1898 the Mumbles Pier has been a traditional seaside destination for over 100 years. Why not add your memory to our Digital Memory Archive? Looking for a unique and memorable party venue? Read More The Mumbles Pier filled with all its unique quirks and differences allows for a party like no other. No trip to the seaside is complete without a visit to the amusements arcade and ‘The Amusements’ at the Pier will be sure not to disappoint. This 835ft structure has dominated Swansea Bays landscape for over 100 years. Currently the Pier is halfway through a dramatic multi million pound renovation project. There have been lifeboats stationed at The Mumbles for over 175 years. During this time, more than 800 lives have been saved and many more people rescued – over 400 in the last 5 years alone. Mumbles Pier is renowned for its fishing. As part of the piers renovation project we have introduced two new fishing platforms at the end of the pier. At only £2 a game its perfect for all the family! Ideal for Breakfast, Lunch or Dinner the Pier offers an array delicious dishes served all day in our Beach Hut Café. Or why not grab a takeaway Fish and Chips from our Copperfish Takeaway and relax on the end of the Pier to enjoy your fish supper or indulge in some tastes of Wales in our Copperfish Bar and Restaurant. The Pier also has a fully licenced bar, traditional sweet shop and of course ice cream parlour all for you to enjoy! The Mumbles Pier has been part of Swansea since 1898, a family run business the Pier is one of very few privately owned Piers left in the UK. Once a station for the world famous Mumbles Railway, Mumbles Pier has seen many decades of changes, a gateway to the Mumbles Lighthouse and home of the Mumbles RNLI station, the site is steeped in a rich history and continues to be a popular seaside tourist attraction for families across the UK. The Mumbles Pier filled with all its unique quirks and differences allows for a party like no other. Whether it be a Private Function in our Pavilion Cafe or a Kids Party in our Amusements Arcade we have something for you. With our dedicated team of party planners, we aim to make the booking and the execution of your event as seamless and as easy as possible. Do you have old photos of Mumbles Pier?